Since we print and make paper coffee cups, we feel that we are a large part of the coffee industry. We work closely with our clients and we hear all sorts of news about new coffees and teas, desserts and lots of coffee shop news. PT’s Coffee Roasting – https://twitter.com/PTsCoffee in Kansas. They post cute photos and up-to-date images like their paper coffee cup with a “I voted!” sticker on it. They post lots of images of their coffee shops, their food and coffee and once in awhile stories, related to coffee. Blue Bottle Coffee – https://twitter.com/bluebottleroast – based in Oakland, CA, but nationally known (we have one opening in our town soon). They post tweets about their company history along with delicious pictures of coffee and pastries. Love how they show and explain their different coffee and menu items. They also call out cities they have coffee shops in. Peet’s Coffee – https://twitter.com/peetscoffee – based in California. We’ve been to the Peet’s in New Orleans and they have such a homey feeling that for the longest time, we thought they were a local New Orleans-only coffee shop. But they are national. They share photos of their staff at charity events and of course post images of their delicious coffee and edibles. Just the name alone catches our attention. They have a Death Wish chocolate bar that they like to post photos of, this and their coffee images are to die for. They post links to their blog, with great stories, for instance, showing how they make their Death Wish chocolate bar! They post a lot and they share a lot from stories about friends, they share info about local concerts and lots of Instagram photos. The Coffee Bean – https://twitter.com/TheCoffeeBean – based in California, since 1963! They post funny things like: “All you need is love. And tea. You definitely need tea.” And they share lots of cool and colorful photos like their winter paper coffee cups, which we are totally partial to. They sound strong – not them, but the coffee. Their outdoor seating is back, they explain after a long permitting process. They have gorgeous photos of their neighborhood, but how can you not get fantastic pics of San Francisco? They share their products, too. Laughing Many Coffee Company – https://twitter.com/laughingmanco in NYC. They post fun photos – of Halloween, of their products, of their groovy black paper cups. And they share links to founder David Steingard’s podcast. They have a fun account. We’ve been receiving a lot of orders lately for printed paper cups, but they aren’t all for coffee shops. While we have many coffee companies and coffee shops as clients, we also print paper cups for so many other places. We do many for fashion houses believe it or not. They use the cups for their many fashion shows and events, they have their name and brand displayed on the cups. We have one law firm client in Boston, that orders thousands of cups every couple of month. That’s a lot of cups! They tell us they have a lot of clients who pass through their office and enjoy coffee in the branded cups. We have a dentist client who orders paper cups a few times a year with his brand printed on them. They really are a great marketing tool for any event, especially conventions and offices. And many colleges use them at recruiting events. 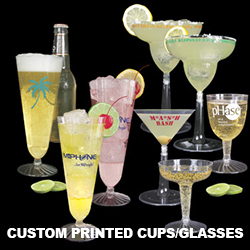 Wedding parties use the personalized cups, too, with the bride and grooms’ names on them along with the wedding date. They are a nice classy touch added to all events. We were just at a recent Comic Con and they had super hero paper cups all over the place! We offer low quantity minimums and sell at wholesale prices to everyone. Our greatest achievement these last few years is making and printing full color paper cups. For many years our clients asked for these and now we offer them. Whether it’s a single color logo or message of a full color printed wrap, we offer it all. Check our personalized paper cups out. They may just be the low cost promotional items you have been looking for!